Hi, out there! So no one cares who the new president of Asbury is. Not a single comment. Today we were in the neighboring village of Guirand. We are on their preaching schedule so are there at least two times every quarter. I was on duty today. Our friend, Major Emmi has a house next to the corps so we always get to stay for dinner and a relaxing afternoon away from the clinic. Guirand has a corps of about 100 people and they don’t have a corps officer. Currently, a young woman who hopes to go to training in the next couple of years is in charge. Most candidates are required to be in charge of a corps or outpost before going to Jamaica. We just don’t have enough officers (or quarters) for every corps/outpost and it is a good way to see who the serious, capable candidates are. Matthew got to wear his new clothes made by the wife of our lab chief. For less than US$7 she made the pants and shirt. 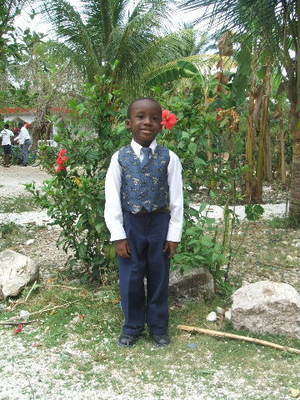 The vest and tie are from his dedication suit (he was 18 mths at the time). Finally, Matthew has some pants that aren’t “floods”. He has grown taller, so although his other pants are still big in the waist, they are about 4 ” too short. Thought that I would share with you the outline of my message. Intro: Salvation Army principle of Self-Denial: All posts are to give for the international advancement of God’s work. The work in Haiti is here due to the sacrificial giving of others. Today, countries are pleading for The Salvation Army to come and help them. Paul collected a similar offering to aid the Christians in Jerusalem and Judea who were going through a difficult time. Sure..go ahead…and I might use your message as well for our SD day in HL. : ) Adorable picture of your son. Always wanted to go to Asbury as a teen/young adult but could never get my act together financially or otherwise to make it happen. Matthew is certainly photogenic! And nice new duds!I find it interesting that there is the requirement for candidates to be in charge of a corps prior to going to training. Does that really work out well? I was excited about the new Asbury president. I still have tons of friends there and I heard it from you first. She was there when I was there but I didn’t know her. I’m sure she’ll do well. It is nice to see a picture of Matthew without floods! What a handsome little man! Nice outline! I’ll be praying for you! Always love reading your site. Thanks for your prayers for Katelyn and me. I love Matthew’s new suit. Glad you had a good day of fellowship and relaxation. What a handsome young man. he is an honor to you. I’m surprized by the president of Asbury. The other president was axed in a less than Christian manner. I would love all the details on that . . . or maybe not. blessings on you and your inspirational work. I don’t get to stop by often, but glad I did today to see your most handsome fellow in his new suit. What talent your lab chief’s wife has to recycle the older items! I’m very impressed. Hi!! It was the guy that followed Rader – Ir ead about it either in Leadership or Christianity today. It was like a big scandle that the board of directors all but kicked him out and he was very gracious, but said he would not be the scapegoat – I hate to even tell you how familiar it sounded 😦 — I’ll see if I can find the article. Very sad. Trust all is well – you are in our prayers daily. Kiss that handsome little guy for me. Violet – what a great article and picture of Matthew in the US Wary Cry. It is a full page. He is really going to get a big head! I always do the egg thing. Its the highlight of my vernal equinox.